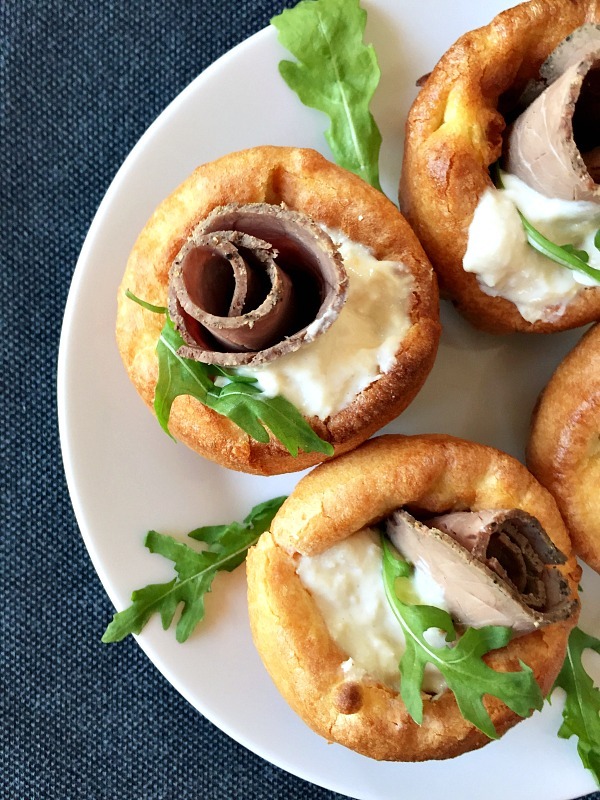 Mini Yorkshire Pudding Canapés with roast beef and horseradish sauce, the very best appetizer of the British cuisine. Adapted from Jamie Oliver’s recipe of Yorkshire puddings, these appetizers are the perfect finger food for any party, like Christmas, New Year, birthdays or a posh Sunday Roast. You may be misleaded by the term pudding. Although it usually refers to a dessert, these pretty little things are the savoury kind of goodies. Yorkshire puddings are part of the very British Sunday Roast, and they have been so for some hundreds of years. Initially, they were called “dripping pudding”, as the batter was placed beneath the meat that was roasting on a spit above a fire. In this way, the juices and fat dripping from the meat were not going to waste, but instead they could give flavour and colour to the puddings. History never ceases to be fascinating! The Yorkshire Puddings are still extremely popular nowadays, never missing from a true British roast meal. 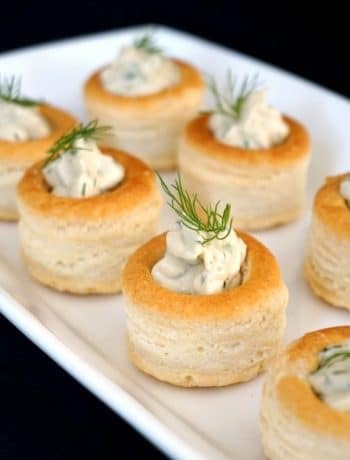 And the mini Yorkshire canapes are just as delicious and posh. I absolutely adore Sunday Roast, and always look forward to it, to the juicy roast, the gorgeous roasted vegetables, the divinely tasty gravy, and, of course, the Yorkshire puddings. These British appetizers are just another way of serving these beautifully tasty puddings. Making them at home is actually a lot easier than you would have thought. 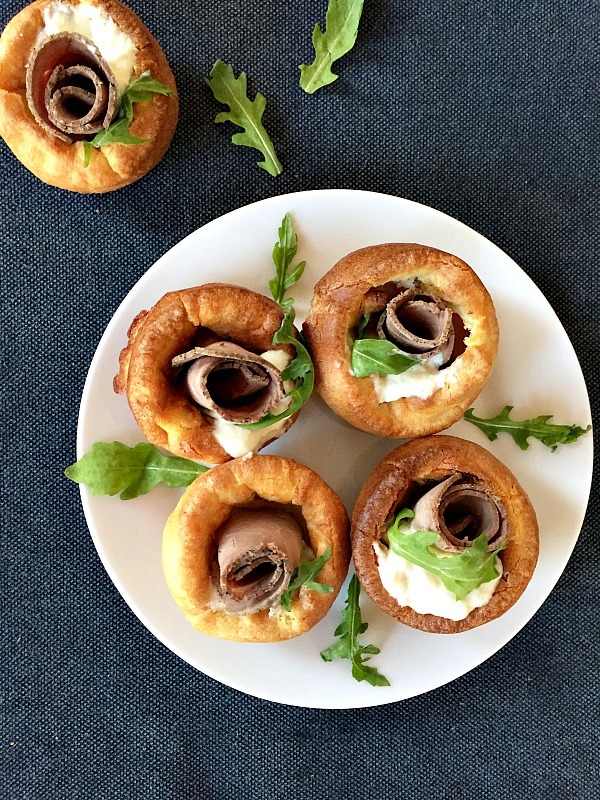 How do you make mini Yorkshire puddings canapes? There are a few tricks worth keeping in mind, if you want nicely puffed-up puddings. And I have watched the very best chef, Jamie Oliver, make the very best Yorkshire puddings. And this recipe is based on one of his recipes, so you know it really is top notch. FIRST, the oil/fat has to be smoking hot when you add the batter. SECOND, it is crucial to leave them bake undisturbed, as opening the oven too early could flatten them up. And, one more thing, the batter has to be really, really smooth. No shortcuts, please!!! Horseradish sauce and beef are just too good together, I wouldn’t use any other sauce for the filling, really. You could, of course, use any other meat, like chicken, turkey or ham, it is entirely up to you. I am sure they would disappear quickly, but just in case, I feel it is my duty to mention that these Yorkshire puddings are best served immediately. I find that, left hanging around for too long makes them pretty soggy and sad looking, as they won’t be nice and crispy anymore. So, now let’s get the party started, time to show off these little beauties! 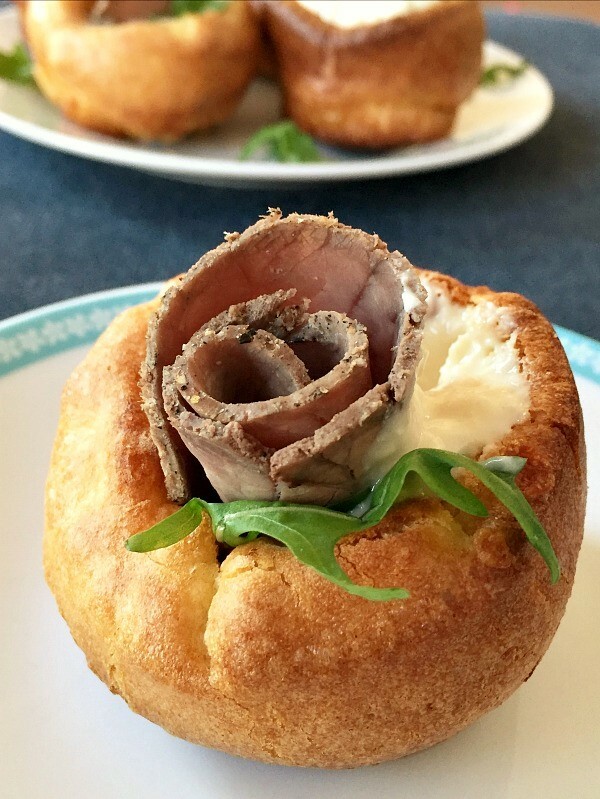 If you’ve liked these MINI YORKSHIRE PUDDING CANAPES or any other recipe on the blog, then don’t forget to rate the recipe and let me know how you got on in the comments below, I love hearing from you! You can also FOLLOW ME on FACEBOOK, and PINTEREST to see more delicious food and what I’m getting up to. 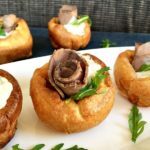 Mini Yorkshire Pudding Canapés with roast beef and horseradish sauce, one of the best British appetizers or sides. The perfect finger food for any party, like Christmas, New Year, birthdays or a posh Sunday Roast. To make the batter, sift the flour into a large bowl, make a well in the middle and add the eggs. Use a whisk to mix them very well, then gradually pour in the milk, and beat well until the batter is smooth. You can pass the batter through a sieve, if you think it is not quite lump free, as it should be. I do not have a Yorkshire puddings tin, which usually has larger holes, but the muffin one does a pretty good job. Of course, the puddings will be smaller. Add one teaspoon of oil into 6 hole muffin tray and place the tin in the oven for 5 minutes, so that the oil can heat up. Carefully remove the tin from the oven, and quickly pour the batter evenly between the 6 holes. Place the tin back in the oven and leave undisturbed for 20 minutes until the puddings have raised and browned. Remove them from the tin, and top with rolls of roast beef and a good dollop of horseradish sauce. These look gorgeous! I love horseradish! I could eat a whole mess of those! Just pour me a glass of wine and step aside! What a wonderful idea! I’m using these for my next dinner party!!!Thanks. I’m very happy you like them ? This is something new to me. Sounds interesting. Looks YUM! I really love horseradish sauce and this looks like a great idea. 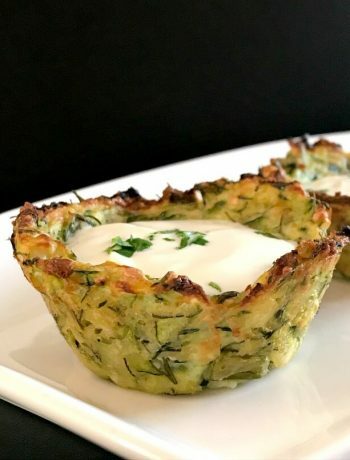 These are such cute little appetizers! Wow these sound great! My husband would love these! I’m sure this is a hit at many parties! Nice way to add a British touch to a dinner table! Sounds tasty! Will these hold a few days before you fill them ? Hi Lynne, thank you for your comment. The Yorkshire puddings are best fresh, if you want to use them a few days later, it’s better to freeze them and just pop them in the oven to defrost before filling them. I made these for a Brtish themed bridal brunch. We had tons of food but these were first to be cleared out & we had rave reviews over them. 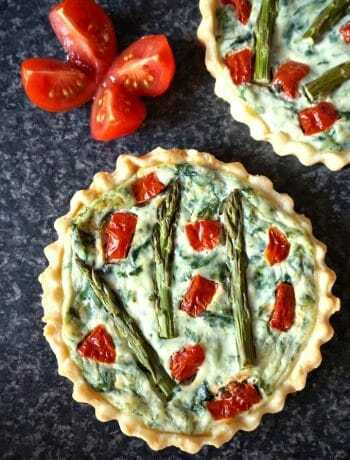 Great recipe – Will for sure make again! I’m happy that they were enjoyed, l’m a big fan of British food.